I have been kept from my loom at home this week. Normally this would have left me very agitated but it has been for a very good reason. I spent my Friday goof-off day and all weekend working on a slide presentation and then woke up on Monday morning to my boyfriend reading to me from the newspaper over breakfast about an Encuentro de Tejedores (gathering of weavers) that was going to happen right here in my home Santa Cruz. Oh darn I thought with a sinking heart, I bet it’s on when I am due to be away in the US. So, when does it start? I asked, dreading what would surely be a disappointing response. 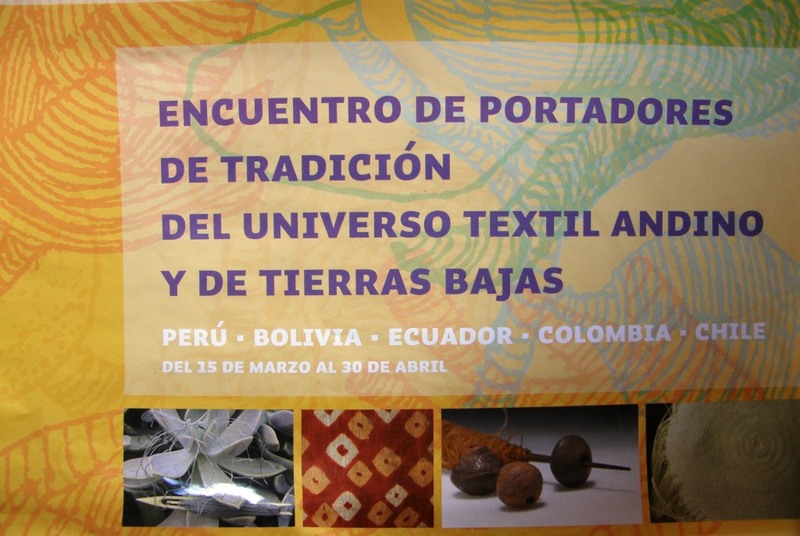 which brought weavers, artisans, anthropologists and academics from Colombia, Ecuador, Peru, Argentina and other parts of Bolivia to my lowland home. Now this sounds like an enormous gathering but it wasn’t really. Only two to four people came from each place which has made it an extremely intimate experience with plenty of space and time to spend chatting with and getting to know people. Only a handful of outsiders such as myself have attended which makes me feel even more privileged but at the same time alarmed and saddened although not totally surprised by the apparent lack of local interest in this event. Perhaps it wasn’t widely advertised in order to preserve this intimacy and make it more possible for the weavers themselves to interact more closely. Either way I feel extremely blessed to have been able to participate. 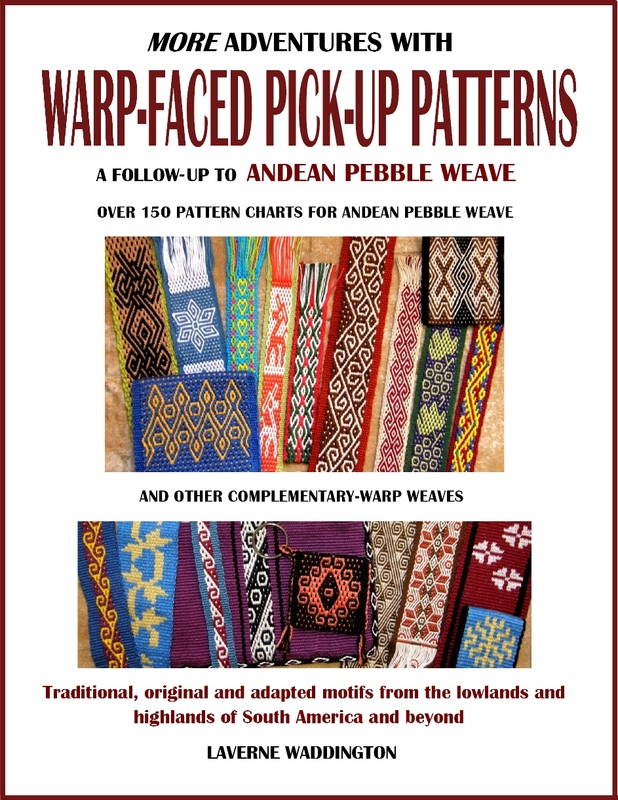 Weavings from highland Peru, lowland Bolivia and the Chilean high plains. So, this means that this week’s blog post will be rather short as there are still two more evenings and one more day of conference to go. I will give you a few tidbits here to whet your appetite for a full report next week. I am still in the process of gathering information, facts, etc…and would hate to get anything wrong and I apologize if I have misspelled names. I will tell you now that this whole event was organized by three wonderful Chilean ladies, the idea for which had its roots in an exhibit by Chilean artist Natasha Pons, which will run here for a month, called “Relatos Migratorios”. The Centro Cultural Simon I Patiño made it possible for people like me to experience all this for free. I still haven’t gotten over this fact! 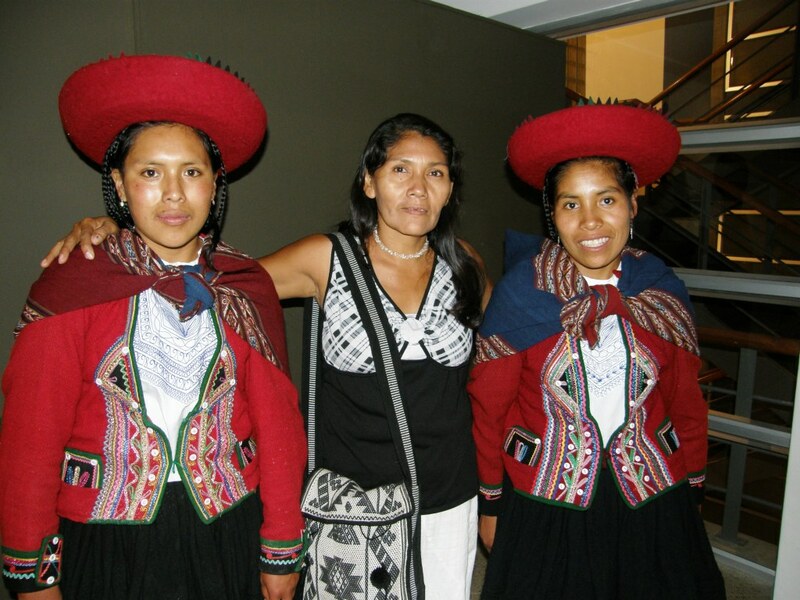 Angela Suarez, a Guarani weaver of the Bolivian lowlands met Chinchero weavers Sonia and Sanaida(sp) at the inauguration gathering. The inauguration of the conference and exhibit took place on Tuesday. 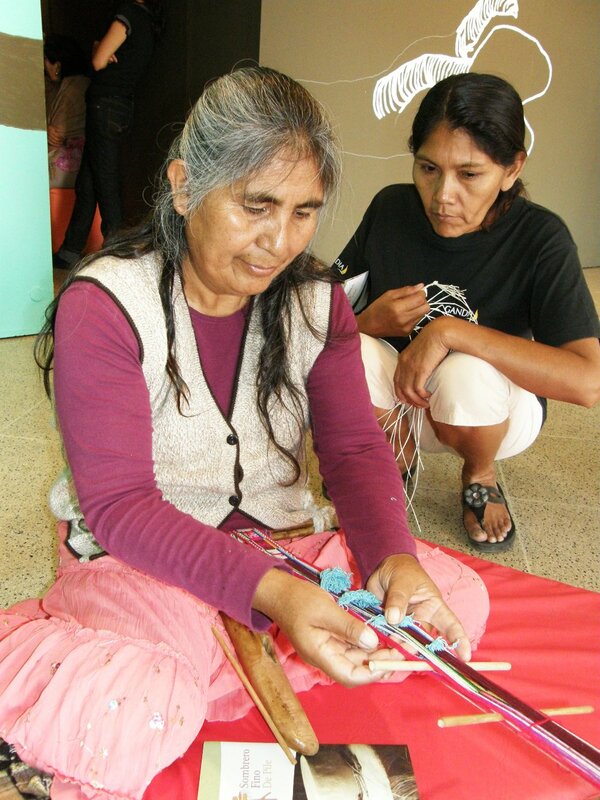 I went along and met up with my Guarani weaving teacher Angela. Walking up the stairs at the cultural center, my heart skipped a beat when I saw two ladies from Chinchero, Peru right behind me. Last November after a little weaving class with Angela we had to part for some time as I was leaving for the Tinkuy de Tejedores in Peru and she was going to her home of Isoso to organize the weavers to make an enormous order of woven Christmas cards. I had told her about the exciting event in Cusco all the time wishing that I could have gotten my act together and taken her with me although I doubt that she would have gone with the extra responsibilty she was carrying at that time to fulfill the Christmas weaving orders. So, here now was a little part of Peru coming to her instead! along with Colombia, Chile and Ecuador. And, on top of the beautiful pebble weave bag that she is carrying in the picture above, she brought one her wonderful works-in-progress in the Moisy technique to show to the highland weavers. The program comprises three mornings of four-hour workshops along with audio-visual presentations and conferences in the evenings. The first day’s workshop was backstrap weaving which was offered by the ladies from Chinchero along with Celinda and daughter Isobel, Aymara weavers from the northern Chilean highlands. Organizer Cristina introduced the workshop and put it very well when she explained that there are many roads that can lead to a single destination and many ways of achieving the same objective. 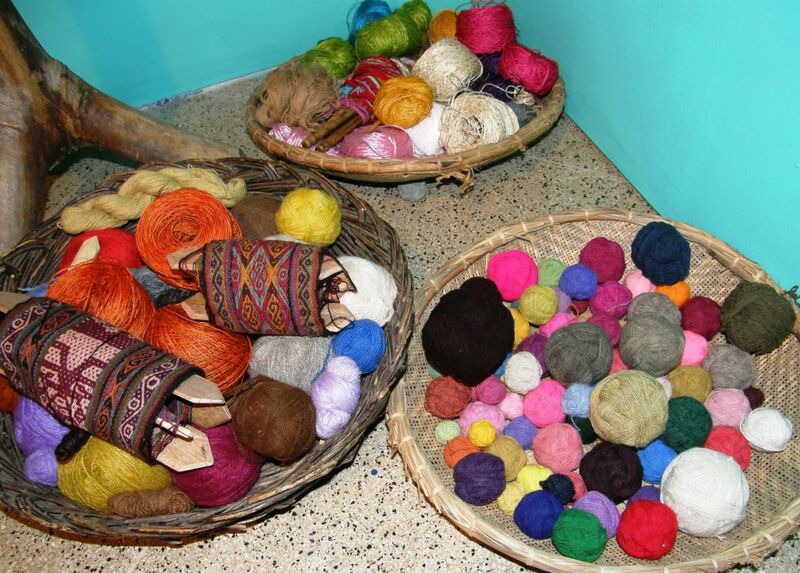 The warping, set up and weaving techniques used by the Aymara and Quechua weavers teaching us here side by side have their differences but our goal, she explained, would be to learn to weave narrow bands, called jakimas in the Quechua language of Chnichero, and what the Chilean weavers call cintillos. 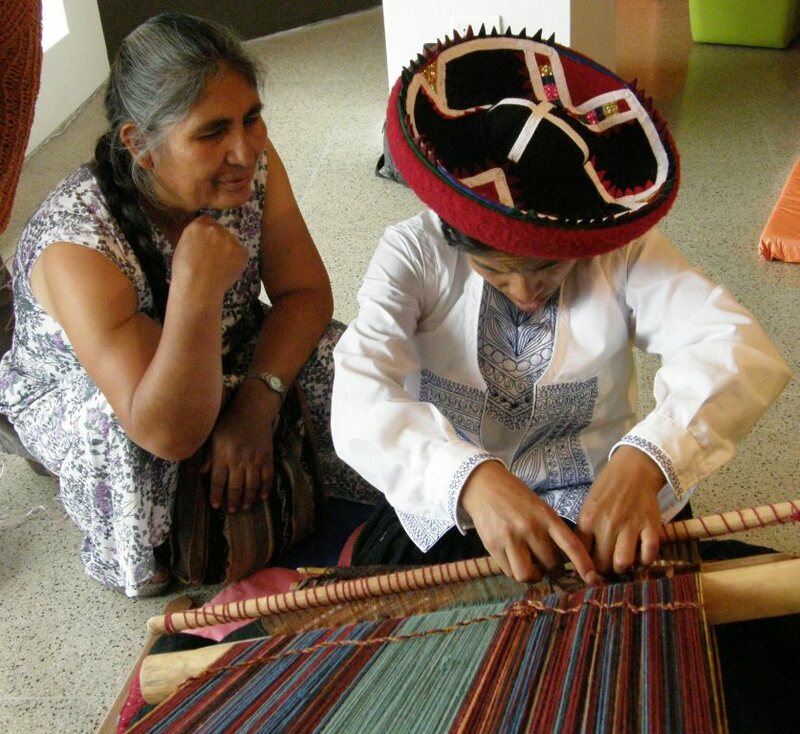 Aymara weaver Celinda watches with fascination as Chinchero weaver Sanaida works on her pick up weaving. Cabuya fiber artisan Maritza from Colombia receives help from Sanaida while one of the Ecuadoran gentlemen prepares his warp around a pair of table legs. Well, you can imagine that this had me wanting to hop from one group to the next so as not to miss a thing! but I settled finally with Sonia and wove my first flat band with the gorgeous Chinchero handspun (I had used this fiber before to make tubular bands at the tinkuy). My experience with my own handspun has been almost exclusively with llama fiber and so there were quite a few interesting things to note about this wool warp, the behaviour of the weft, the appearance of the woven surface from the high twist yarn and the different kinds of weft that Sonia and Sanaida were using. Having the backstrap weaving moves down, I was able to focus very much on the material rather than on the technique. So, I did get to weave this week after all. Cabuya fiber from Colombia and handspun wool from Chile and Peru along with other random bits of cord and twine that we used to tie up the warps. The artisans from Ecuador, Colombia and Oruro in Bolivia joined in enthusiastically as well as a small group of outsiders such as myself and staff from the cultural center. Most outsiders were non weavers and were terrified to beat hard and pull at the warps fearing they would break. The handspun wool was of course wonderfully resistant which was a good thing as there was the usual amount of beginner heddle-sawing going on. I didn’t have to worry too much about missing out on Celinda and Isobel’s (the Chilean weavers) instruction on day one as today Angela and I got to spend a lot of time with Celinda as she wove. I found her very tranquil and lovely to watch. Daughter Isobel, on the other hand, is a live wire! You will see and hear more about her next week. 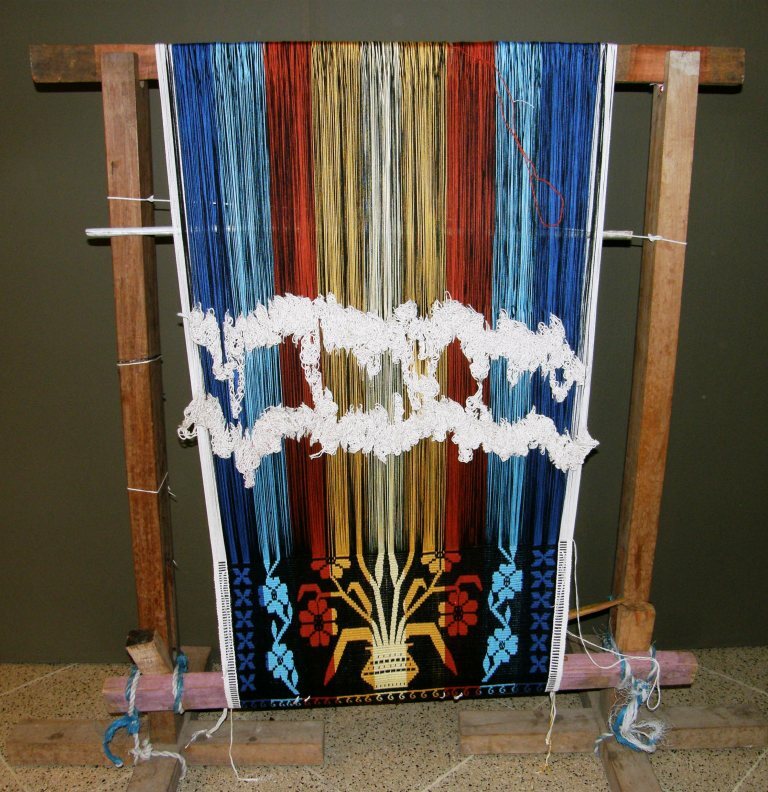 The technique that Celinda was demonstrating is a variation of the Moisy that Angela weaves except with three patterning colors which requires a fourth set of string heddles to manage. This does not create a double faced textile but there are no long floats on the back of the band either. Angela noted that Celinda’s heddle order arrangement was quite different to hers and asked many questions. I could see her soaking it all up. Finally she wasn’t asking questions but rather pointing things out to confirm that she did indeed understand. I wouldn’t be surprised to see her adding this to her repetoire and you can be sure that if she believes that any of Celinda’s ways are better she will adopt them. 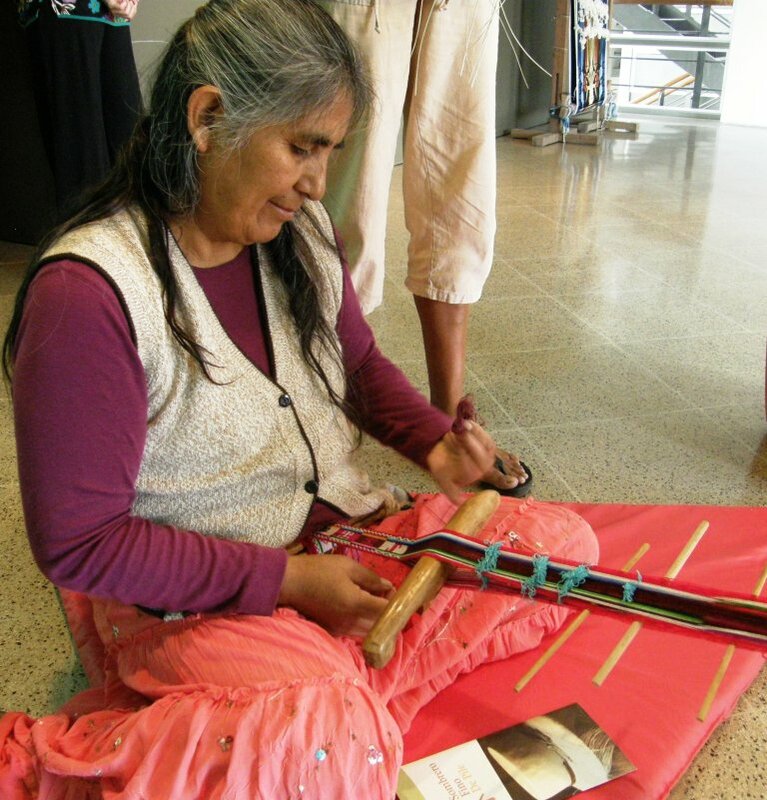 She is already using a stick for her lower set of heddles on her narrow bands after asking me to teach her how to make them on a stick – something she said she had always wanted to learn. Well, I really must stop here as there are more events to attend tonight and one more day of this conference to go. No doubt there will be much to tell and show next week. 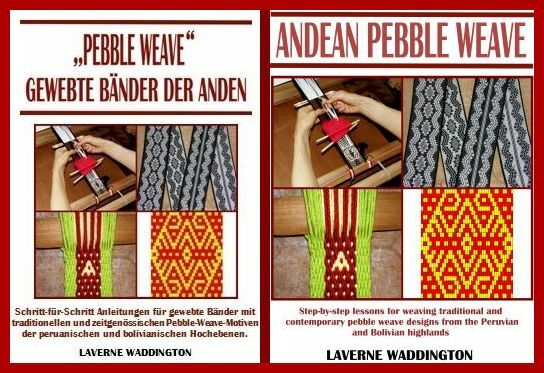 I can’t go without giving my thanks to my online weaving friend Kristina Krenzer who has worked hard to translate my e-book Andean Pebble Weave to German. 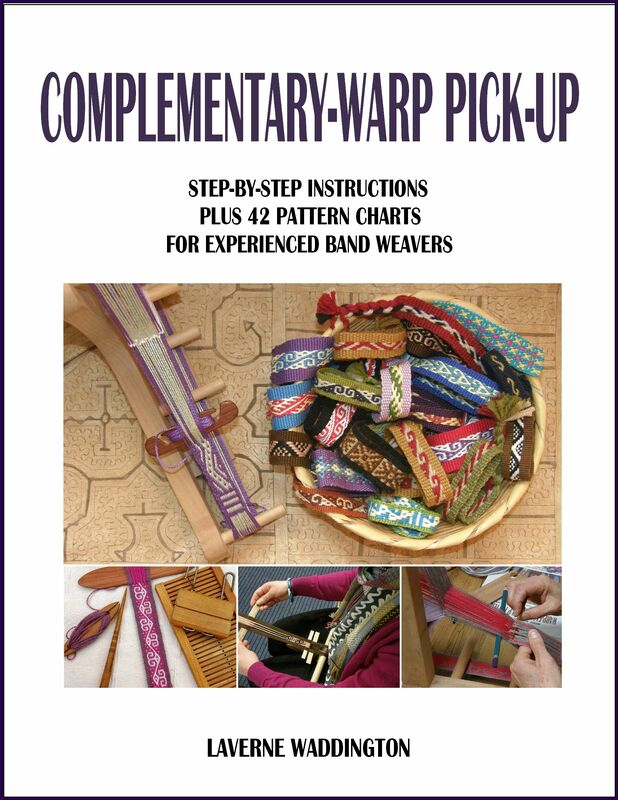 It is now available on Patternfish. It looks so weird and, at the same time, so great in another language! Of course you can get the English version on Patternfish too. Ich danke Kristina Krenzer für die Übersetzungsarbeit. 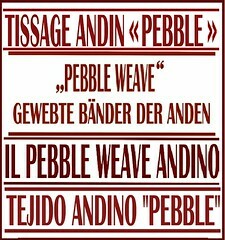 Meine Monographie über die Stippenweb-Technik der Anden, auch bekannt als “Pebble Weave”, ist nun auch in deutscher Sprache bei Patternfish erhältlich . How very interesting and exciting! 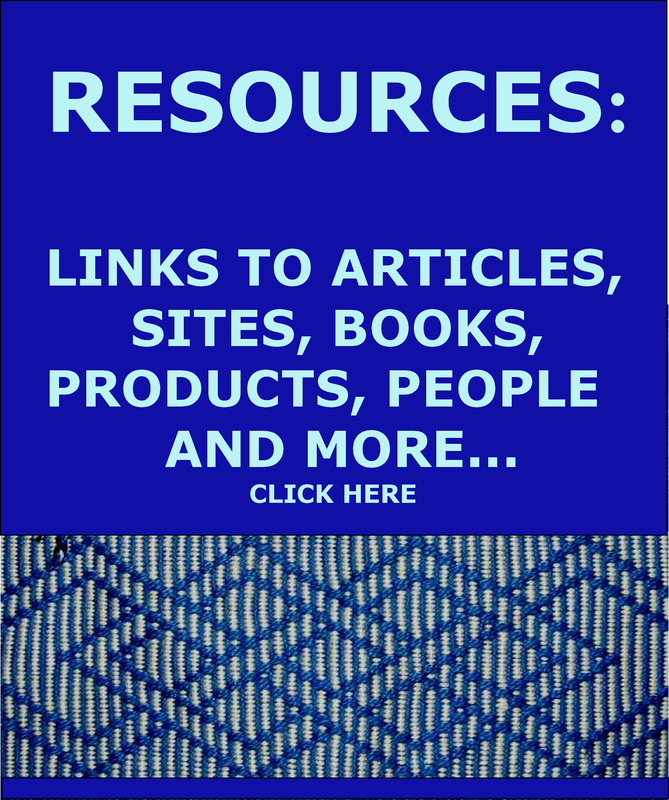 I so love learning about all this. thank you for sharing it with us! Angelas Moisy technique piece is absolutely gorgeous! I look forward to the rest of the story. Hi Laverne, thank you so much for being eyes and ears for us. We are so lucky you can attend to such wonderful event and share you experience with us. Great photos ! I am looking forward to your next post.Greetings to all the lovely people you meet up there. Thank you for sharing all this. It is so wonderful. I love the colors! Oh, I can’t wait to hear more. What a wonderful surprise and a great way to spend a few days. Bravo Jorge for finding this conference in the newspaper. I’m sure you’re having a great time. I look forward to future installments. I want to know more about that first warp! What a wonderful opportunity for you! The weavers look beautiful. 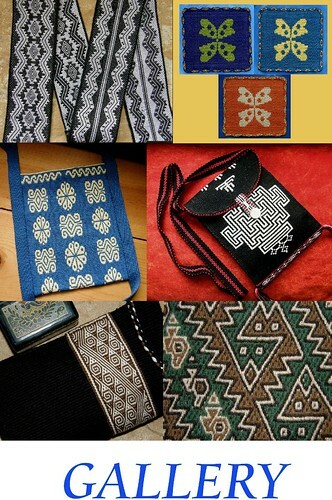 The multi-colored weavings are amazing. Do you know if the little balls of wool are wound around something? A felt ball or something like that maybe? I know that it is tightly overtwisted, just wondered how it is handled. Have fun with the rest of the conference. I’ll ask today. I know the weavers here in Bolivia use a core…sometimes it is a stone, a wad of paper. In Ecuador and Guatemala my teachers used small dried corn cobs cut in sections. The Chinchero ladies told me that they most often wind around a stone. Amazing color! I would love to see the weavers in action. Did you capture any video of the event? Certainly did. I got the interaction between Angela and Celinda too which I particularly like. I may put some clips on the post next week. You see Laverne, it’s true: If you weave it, they will come…right to your own backyard! Have fun.